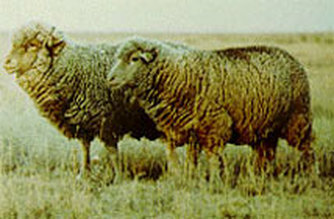 Debouillet sheep were developed in New Mexico in 1920 from Delaine Merino and Rambouillet sheep. They are well adapted to the range conditions of the southwestern United States. They are a medium-sized sheep with white hair on their face and legs. They are hardy and gregarious and adaptable to unassisted pasture lambing. They produce a fine wool fleece with a deep, close crimp.